Please note: Global Chat is a privilege, not a right. It does NOT affect your game play in Tabletop Simulator, nor stop you from playing in multiplayer. The global chat is a community chat that you are logged into when you first open up Tabletop Simulator. 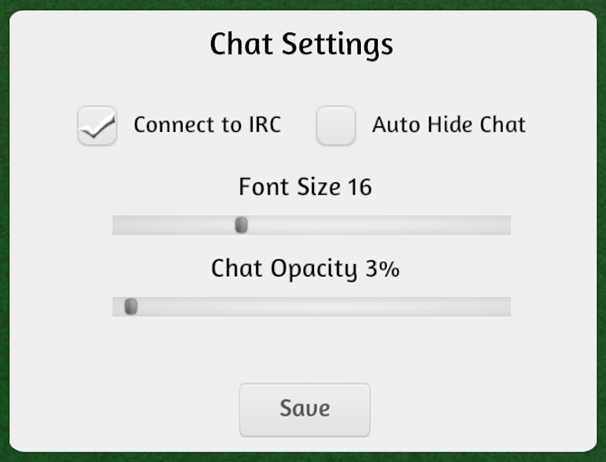 If you’d like to turn off global chat, you can do so by clicking the settings icon next to the chat tabs and uncheck the “Connect to IRC” box, then click save. If you want to opt back into global chat, then open it up again and check the box. The global chat is moderated to prevent spamming, griefing, and excessive behavior. There are bots that auto kick for saying certain words and most profanities will show up as <censored> to everyone except for the person who originally posted it. TTS is considered family friendly, which is why we are moderating the chat. We can’t moderate other parts of the game, but the global chat is easier with the help of our moderators. The global chat is part of the Geekshed network and they have their own rules which also need to be followed. If you’d like to join the IRC channel outside of Tabletop Simulator, the server is irc.geekshed.net and the channel is #TabletopSimulator. Due to issues with spammers, the following web clients are banned: Mibbit, IRC Cloud and Light IRC. If you get a Z:Lined(BANNED!) message, then you need to submit an appeal on the GeekShed forums as that means you were blacklisted by them. If you are kicked, you can join back in. Please do not keep pushing the mods/bots, as after so many chances you will be banned. If you are banned, it is only for 3 hours. Consider this a time-out period. This should be self-explanatory. These bans are permanent. Do not get on the perma-ban list. NOTE: Kicks/bans do not affect you playing in Tabletop Simulator. It only blocks you from global chat. That being said, these are the rules for global chat. These do not apply to public and private games. 1. Please keep the chat in English. Feel free to look for people to play with in your language (a couple lines), but the general chat must be kept in English. Once you find someone to play with, you can private message them by using /msg name message in the global tab. 2. Do not try to get around the filters. If you continuously try, you will be removed from chat. 3. Do not harass other players. We are a community and a pretty good one at that, so let’s keep it that way. 4. Remember that TTS is family friendly, so keep younger audiences in mind before chatting. 5. Ignore trolls. If someone is trolling, don’t play along with them. You could be the one who ends up being kicked! Just ignore them… completely. They will get bored if no one pays them any attention. 6. Keep religion/politics chat to a minimum. The chatroom is made to help the Tabletop Simulator community find players, reconnect with lost players, discuss games and ask for assistance on issues regarding Tabletop Simulator. Starting topics on religion and politics is just asking for trouble/arguments. 7. If you get banned in a server, do not make a ruckus on global chat about it. It’s fine to ask a couple questions, but do not continue over and over, especially if the person doesn’t bother reading the chat and is not responding to you. There is a reason why someone banned you and it needs to stay private and not in global chat (if you get no response). Thanks. 8. Do not argue publicly with the mods. If you don’t like how they moderated something or concerned with how something was done, talk with them privately “/msg name”. If it still goes unresolved, send an email to berserkgames@gmail.com. 9. Bots of any kind are not allowed. We have our own bots to help with keeping the channel clean and for posting announcements. 10. No hate speech of any kind is allowed. 11. No advertising of outside games or websites that do not pertain to tabletop gaming and Tabletop Simulator. Remember – mods can’t be around all the time. And even when they show up, you can’t have them try to fix something that happened BEFORE they arrived. Chat is an instant thing, it’s not like posting on a forum that sticks around. While we appreciate you wanting to help out in chat, please do not backseat moderate. If you encounter some problems in chat, just leave it to the moderators to deal with. People will not listen to you if you are not a mod, and chat will end up being more of a spam fest than it already was. If there are no mods online and there is extreme issues in chat (botnet, massive flooding, etc), then the Geekshed staff will intervene.